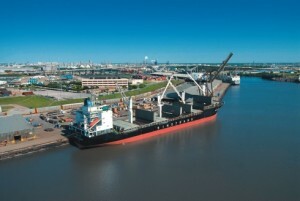 The Port of Houston Authority had a tremendous year in 2014, setting records for both steel and container cargo, Executive Director Roger Guenther announced Tuesday, Jan. 27. In a report to the Port Commission at its monthly meeting, Guenther said PHA’s terminals handled more than 37 million tons of cargo last year, which marked an increase of 5 percent compared to the previous year and also set a record. “The unified and collective effort of all of our stakeholders is the key to what continues to make the Port of Houston a great economic engine for not only our region, but for the state of Texas and the nation,” Guenther said. “Cargo volumes continue to be strong as we begin a new year and new century for the Houston Ship Channel,” he added. A total of 6.6 million tons of steel crossed the Port Authority’s docks in 2014, breaking the previous record of 6.3 million tons. Container tonnage topped 19.4 million tons last year. Other business lines also performed well last year, making it one of the best years to date for grain and bulk exports, Guenther said. The strong showing in 2014 resulted in solid financial results for the Port Authority, with $261 million in operating revenue, $39 million in net operating income and $116 million in cash flow. “These healthy results are vital to our continued success as we prepare for even greater growth and prosperity in the future,” Guenther said. Plans call for a significant capital investment plan during the next five years that will include new and redevelopment projects totaling in excess of $1 billion. Among 2014 highlights Guenther cited Tuesday was the beginning of the deepening and widening of the Barbours Cut and Bayport channels, an $80 million project that is funded by the Port Authority. He also recognized high productivity levels for Port Authority cranes, with more than 99 percent reliability, which is well above the national average. At the same time, PHA’s focus on safety awareness resulted in a decline in incidents. Strategic real estate agreements supporting cargo operations also were executed during 2014. Those included agreements with Enterprise Product Partners for the export of ethane and with Frontier Logistics for the export of plastic resins. Additionally, the Port Authority is accommodating new alliances of container carriers, including one between the world’s two largest container lines, Maersk and MSC, which will allow for their future growth through Port Authority facilities. For 2015, a key Port Authority priority is to explore and develop an even more diverse range of cargo, including opportunities for the shipment of refrigerated goods through the port. PHA also is preparing to handle an increase in plastic resin exports that is expected during the next several years. The Port Commission Tuesday voted to enter into a 30-year lease agreement with the Houston Maritime Museum for property on the southwest side of the M/V Sam Houston Pavilion to serve as the site for constructing a new museum facility.